Winning its bid to host the 2012 Olympic Games could earn the UK more than £2bn in extra tourism revenue, industry leaders are predicting. A million more international visitors are expected because of the decision. The Olympics offers the UK tourist sector its "biggest-ever opportunity", tourism experts said. But Tourism Society chairman David Curtis-Brignell warned that despite the success so far "the hard work has only just begun". To reap the longer-term benefits of London's bid victory, visitors to the UK would have to be given "a truly world-class welcome and enjoy exemplary facilities and service everywhere they go", he added. But he said if that happened the tourism benefits would be felt long after 2012 across the whole country. "The Tourism Society will do everything it can to assist in the preparations for the Olympic Games," he said. "We will work along with the entire tourism industry to ensure London and the other venues in England put on the best possible show in 2012 and create a sustainable legacy thereafter." "This will surely go down as one of the most momentous days in the recent history of London and the UK." National tourism marketing agency VisitBritain is calling for the development of a "dynamic partnership between government, sport and tourism... to maximise the opportunities and deliver the best possible welcome and experience to our visitors". Work would now start to help tourism industry bodies across the country deliver the "best possible experience", chief executive Tom Wright added. VisitBritain believes the bid has already raised Britain's profile around the world and boosted investment into transport infrastructure and community facilities that visitors use. And every nation and region is now likely to receive additional leisure and business visitors in the years before, during and after the Games. "The Games provides a great platform to boost the international marketing of both London and Britain as leisure, business and sporting destinations, particularly in new and emerging markets such as China, Greece, Korea, Poland and Thailand," Mr Wright said. Tourism already employs 7% of Britain's workforce, and the government aims to increase annual tourist revenue by 26% to £100bn by 2010, recognising this as the key to further wealth and job creation. Bill Stevenson spokesman for hotel and travel management company Expotel said: "There will be a fight for the estimated 200,000 hotel beds available in London in 2012, as well as those in other cities hosting events." "July and August are already peak months for hotels, so beds will be at a premium during this time with the added demand of tourists visiting the UK for the Olympics." But Bob Cotton, chief executive of the British Hospitality Association, the trade organisation representing Britain's hotels, restaurants and caterers, said one of the key factors in London's bid was its hoteliers ability to provide "hotel rooms of all grades, at the right price". 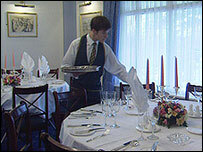 More than 17,000 additional hotel rooms were already being planned for London by 2012, Mr Cotton added. And winning the Games would encourage even more investment. "Not only will the Games give an opportunity to London to promote itself on the world stage, but they will showcase the whole of Britain." Association of British Travel Agents president Martin Wellings said: his members were "already considering the best holiday options for the thousands of sports lovers who will flock to the UK". And it would be a "welcome shot in the arm for the UK tourist industry".